Apex Shelters cycle shelters and motorcycle shelters are designed by our in-house cad team to not only provide stylish storage but also quality, robust and secure bike parking. 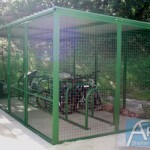 Apex Shelter Systems bike cages and motorcycle cages are an ideal storage solution in areas where security is a priority. In addition for storage for bikes, they make ideal solution for a range of other items such as playground equipment and bin storage. Ideal for the external storage of cycles, motorcycles or scooter racks. 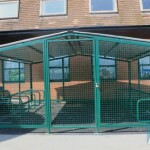 The robust mesh panels provide both high security and visibility throughout the shelter. Bike cages and scooter cages have been designed for ease of installation and are supplied in a flat pack form with full technical installation instructions. Alternatively, a full nationwide installation service is available including ground-works. Please contact the sales office for further information.